As we know, carbon is an element indispensable for all forms of life on earth and in considerable quantities. Thus, the carbon content in the dry matter of the plant is around 45%. Water plants have two ways to obtain the carbon needed for their growth. The first is to capture free carbon dioxide (CO2) dissolved in water and substrate or capture it directly from the air. In the absence of free CO2, many plants have the ability to meet their carbon requirements by taking it directly from carbonates dissolved in water – and this is the second way. While the latter method is a useful adaptation of plants in natural conditions, the aquarium is an undesirable phenomenon. When plants break down calcium carbonate dissolved in water to satisfy their needs for carbon (this process is sometimes called the biological decalcification of water), water is getting smaller and smaller buffering capacity, which leads to serious pH disturbance. In the extreme case, they are able to completely exhaust these carbon resources. 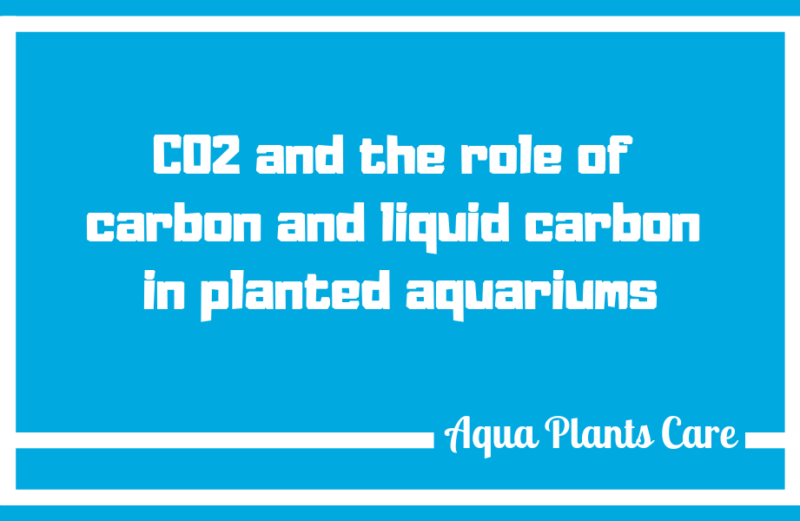 There are many possible CO2 sources in the aquarium. One fifth of the CO2 assimilated by the plants returns back to the water. Fish breathing also brings CO2 into the water. Bacterial oxidation of dead plant material and decoration wood also introduces CO2 into the water. However, the biological filter has the biggest influence on the CO2 level in the aquarium. A fully mature biological filter produces 1 gram of CO2 in 24 hours from each gram of dry fish food added to the aquarium. In a stabilized, moderately lit aquarium (no more than 0.5W / 1 liter of water), with minimal aeration while the light is on, it is possible to obtain a good plant growth without adding additional CO2. With stronger lighting, CO2 dosing becomes necessary. If the pH measurement in the morning before turning on the lighting and the measurement in the late afternoon show drastic differences, it is a signal that the plants use all available CO2 in the tank to the full. If the alkalinity (or carbonate hardness) simultaneously decreases at this time, the shortage of CO2 becomes obvious. The amount of CO2 needed in the aquarium to ensure good growth is estimated at about 15 mg / l, although the safe and effective amount of CO2 in the water can be between 10 and 35 mg / l.
The aquarium consumes with good lighting and the average plant density from 1 to 2 mg / l of CO2 during the hour of photosynthesis. The indoor air contains 1 to 3 mg / l of CO2, and the aerated water is able to dissolve only 0.7 of CO2 contained in the air. Hence, the aeration in the plant tank should be kept to a minimum and CO2 fertilization is often necessary. Without the plants that cover our Earth, both earth and aquatic, the Earth’s atmosphere would not contain enough oxygen. We can use the ability of plants to produce oxygen to create a healthier environment for our fish. Photosynthesis is the heart of the food chain. Plants (and some bacteria) have the unique ability to directly use solar energy. This energy is used for the conversion of water, CO2 and minerals found in the environment for the production of organic matter from which the plants are built. The by-product of this process is gaseous oxygen. The process of photosynthesis is very complex and its description is beyond the scope of this article. For those who are interested (and this is very interesting) it remains to reach for a good encyclopedia. For our purposes, it is enough to understand that for optimal plant growth (and optimal oxygen production) plants must receive light of sufficient intensity, adequate spectrum and for a sufficiently long time. They must have a continuous supply of CO2 while the tank is illuminated and must have access to other nutrients they need for growth. Fledgeling water gardeners often think that adding CO2 to water will reduce the amount of oxygen available in the water for the fish. CO2 and oxygen which are important in the care of the aquarium occur in water in concentrations independent of each other. Adding small amounts of CO2 does not displace oxygen from the water. On the contrary, proper CO2 dosing combined with adequate lighting should increase the oxygen concentration in the water. Often, in the aquarium with really good plant growth, you can see the bubbles detaching from the leaves of the plants. It is oxygen whose production takes place at such a rate that it is not possible to dissolve it in water so it is discharged into the atmosphere. At the temperature that I usually maintain in planted tanks of around + 24oC, the level of oxygen saturation exceeds 8 mg / l (8 ppm). For the health of fish and plants, it is recommended that the level of oxygen saturation does not drop below 60%, which in our case means 5 mg / l. If the amount of oxygen drops below 2 mg / l or 25% of oxygen saturation, the fish may be in danger (These numbers refer only to the freshwater aquarium, the sea has a lower saturation point). In tanks where the CO2 level is about 23 mg / l, the O2 level fluctuates around the value of 11 mg / l during photosynthesis and 100% saturation. The amount of oxygen dissolved in water is such that even in the early morning before the lights are lit, the oxygen level in the water drops to only about 8 mg / l. The bubbles begin to detach from the plants an hour to two hours after the light is on as soon as 100% oxygen saturation is reached. Properly monitored CO2 dosing does not have a bad effect on the fish. CO2 is a gas that is easily released into the atmosphere by moving onto the surface of the water. In tanks with a larger stock of fish, if the amount of oxygen falls below the acceptable values at night, aerator can be used (connected to a timer that activates aeration after turning off the light). Aeration will remove excess CO2 and fill the tank with oxygen. In properly buffered tanks, with moderate fish stock, many people find that the oxygen level in the tank remains at night high enough, the pH values are also stable despite the fact that CO2 is dispensed during the day and at night and the aeration is not used at night. Plants come from many different ecological niches. Some of them require extremely high light intensity and sufficiently large amounts of CO2 and mineral fertilization. Many of our difficult bouquet plants belong to this category. As a rule, these plants are excellent oxygen producers. Other plants have adapted to areas where photophilic plants cannot compete with them. These species are usually slow growing and do not produce large amounts of oxygen. Examples of these species will be the majority of Cryptocoryne sp. and Anubias sp. Many of them grow well in relatively poorly lit reservoirs and their needs for CO2 are sufficiently met in the aquarium by CO2 produced by fish and other biological activity in the aquarium. These plants show poor growth (if any) if we increase lighting and apply CO2 dosing. The third group of plants are plants that are the most popular species in aquariums. These plants have a large adaptability. They can grow well without CO2 dosing, but their increase is significantly better in conditions of strong lighting and CO2 dosing. These species include Echinodorus and Hygrophila sp. and many others. It is important to remember that regardless of whether it is dosed with CO2 or not, the amount of light, CO2 and the amount of available nutrients must be in equilibrium. If we increase the amount of light without matching the other factors, there is a possibility of biological decalcification of the water. Excess of CO2 is at best useless to plants and, as explained below, can be dangerous for fish. If two basic macronutrients (nitrates – including NO2 NO3 NH4 and phosphates) occur in an aquarium in an amount greater than the plants are able to consume then you will experience problems with algae. Many of the trace elements absolutely necessary for plant growth are toxic at higher concentrations. There is a potential danger if we dose CO2 by incorrectly monitoring its amount given to the aquarium. The presence of CO2 in water causes a decrease in pH. It can be used to lower the pH to the range preferred by most plants. However, if the water does not have sufficient buffering properties or if too much CO2 is introduced into the water, the pH may drop to a level that is lethal to fish in the aquarium. It is good to treat CO2 dosing as an additive such as fertilizers, pH regulators, medicines and even fish food because all of this can cause deadly conditions in the aquarium in case of overdose. CO2 is not different. It must be used properly to ensure the safety of the inhabitants of the aquarium. CO2 dissolved in water produces a weak acid and, as noted above, lowers the pH of the water. For moderately hard water it works great. Aquarists who have high alkalinity water may need to lower the carbonate hardness (KH) by mixing tap water with distilled water or water from a reverse osmosis filter (RO filter). Aquarists who, in turn, have very soft water must increase its alkalinity. Without the buffering properties of water caused by carbonate hardness (KH), the addition of CO2 can cause a drop in pH to harmful values for plants and especially for fish. What amount of CO2 is sufficient in planted fish tank? As noted above, the recommended range for CO2 is between 10 and 35 mg/l. The aim should be to apply the dosage to fit in this range reaching a neutral pH (pH7) or slightly lower. Limits on this range should be avoided. If your dosing system is not absolutely accurate, it is very easy to exceed the recommended CO2 concentration values. You can buy ready made sets for measuring CO2 concentration. It is also possible to estimate the level of CO2 based on pH and KH measurements. Liquid carbon in planted aquarium. It is also worth mentioning the ‘Aqua Plants Care Carbo‘, ‘EasyCarbo’, ‘Seachem Flourish Excel’ liquid carbon and other similar products on the market containing carbon in the form that can be easily absorbed by aquarium plants. These products are very efficient and rich in carbon. The carbon is absorbed for about 18 hours, followed by its disintegration, and compounds that arise as a result of decay are not harmful to animals and plants. This fertilizer can be used in aquariums with additional CO2 supplementation and without such a system. A significant improvement can be seen after a few weeks. Carbo provides plants with much better development conditions than algae; in consequence the amount of latter decreases. Due to its properties, carbo supplementation is usually recommended to aquarists with smaller tanks, in which the installation of the cylinder together with the equipment for CO2 is relatively expensive.